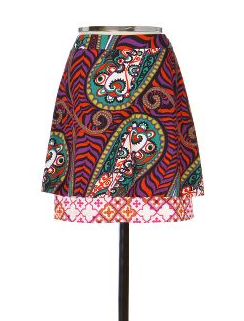 I saw this skirt in the latest Anthropologie catalog and was really intrigued by it. I headed over to Bolt to search for some fabric and came away with some of the new Jay McCarroll stuff from Free Spirit, as well as some cranberry-colored cotton lawn. I haven't done any sewing for a while, so I thought it'd be fun to design and drape a skirt/underskirt pattern. Beautiful fabric. Can't wait to see the final product. Good luck! Which will be the overskirt?